The Hudson Broadcast 9v & 24v versions - My experiences! 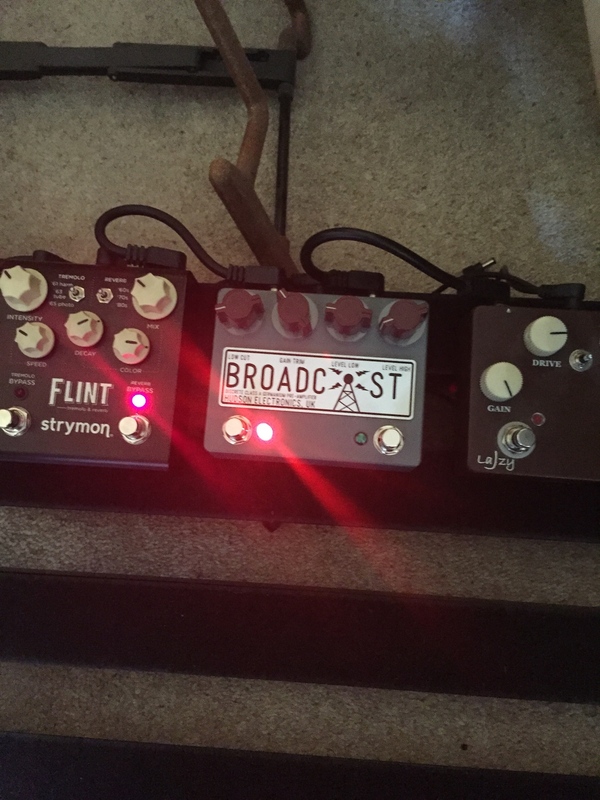 I stuck a £15 boost pedal I built from an Aliexpress kit after the Broadcast, and the two together is the best my amp/guitar has ever sounded. I have just tried out a new combo for silent practice. Boss sd-1w going into broadcast going into mooer radar. Killer tone. I am loving this pedal. I have the 9v dual foot switch, and love it. Quite sensitive to the volume control on the guitar, not as much as a germanium fuzz, but really useful. It's a different sound from many overdrives, not compressed and smooth, but that's what I've been seeking. Playing technique makes a difference in response, and I'm continually learning how to get more out of it. It's not a set and forget pedal if you want to get the most out of it, but I don't find myself tweaking endlessly either. It could be an always on using the guitar volume and moving between the channels once the trim is set, with occasional changes to the bass cut and gain. The internal trim pots can make a large difference. IIRC it came with Ch1 set full low and Ch2 set full on. Channel 1 is great for some growl when you dig in, love it for 'roots' inspired music. Channel 2 can be set high for a fuzz type sound, has a grittier, wilder character even when the trim is set low, but string playing technique can smooth that a bit for lead work. I currently have toned down the second channel to be more like a pushed first channel. I found 18v from my power supply too clean for single coils on Ch 1 (very little pedal effect) but I need to go back and play with the internal trim pots vs power. My supply has 9v-12v-18v options. Overall I hear a slight treble increase with the pedal on, but within the range of a guitar's tone control. The bass cut and gain knobs are helpful for moving between single coils and humbuckers. Maaaaaaaaan what a pedal. Absolutely love it. I’ve just picked up a 9volt 2 button Broadcast.... I’ve put it off for ages as I wasn’t too impressed with online demos....First impressions were ok but not much gain from the low side...I opened up the back maxed out the internal trimpots and Bloody Hell its fantastic... like @Majorscale says in his review, the clarity is amazing and works really well at home volumes. it’s so addictive to play....and feels great under the fingers. The cleanup with the volume pot is also ace. I really wanted a Hudson Sidecar or 999 and if this is anything to go on, I’ll be keeping my eye out. I think the 9v is way better than the 24. I actually use my 9v at 18v, which works out right for me. The 24 is a bit too clean. I agree the 24v can be pretty clean, although it can also get quite filthy on the high channel and / or by tweaking the trimpots. I use mine always on to add a bit of colour to my almost-clean sound, then stack other drives into it for more dirt. Recently I've been getting very nice results with my Snouse BB2. And when you have the back out pull the led's from the coloured lenses - I found the lights way too bright - they are blinding! Withe the less pulled back they are still bright but it's less hassle than fitting resistors. That's interesting - mine is definitely white LED's under coloured lenses for both. Actually, it's not that interesting but it might explain why I found mine so bright. Finally got around to using this recent 24v peach version) and must say I’ve been impressed. A keeper!